That a cultural institution such as Amics de l'Òpera de Sabadell is on the verge of turning twenty-five is certainly a great positive. 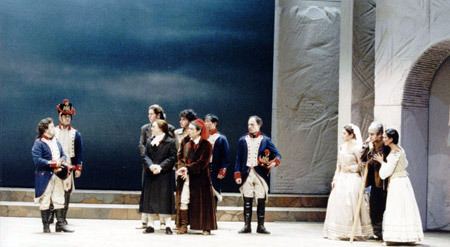 This association, which pursues an important educative programme (offering courses and workshops aimed at operatic singers), labours heroically to mount four productions of lyric theatre each year, with performances in its theatre base La Faràndula de Sabadell, added to an ambitious tour schedule. When in addition it dedicates one of these annual stagings to zarzuela, its work is still more commendable - especially considering that its programming usually avoids the beaten repertoire track in favour of the neglected Catalan sarsuela. Cançó d'amor i de guerra is in that sense perhaps an exception, because the work enjoys good health and it's a rare season when at least one of the numerous Catalan groups fond of sarsuela fails to mount it. In fact the constant demand for performing materials has made the edition of the work this same year by ICCMU (under Joan Casas), another fact to celebrate. This new production was my first direct theatrical experience in the language of Ramon Llull [ed. great Catalan-speaking philosopher, 1232-1315] and because of that it turned out to be an intense experience. The score is of an extraordinary beauty, where all the numbers ooze inspiration. Moments of thrilling epic exaltation stand out - enthusiastically applauded by a large and captive audience - which contrast vividly with no less effective pages of intimate romanticism, every bit as loudly acclaimed. It must be said that all the musical forces in play - from the brilliant Orquestra Simfònica del Vallès through to their committed conductor Daniel Martínez; including all the soloists (amongst whom the excellent Carles Cosías and Carles Daza stood out) and not least the Chorus of Amics de l'Òpera de Sabadell - came together and combined to make for an evening full of vitality, tinged at times as the story demanded, with humour, emotion, passion, grandiloquence and romanticism. But in lyric theatre the music and staging are in different hands, and this latter was not here managed to the best of modern standards. Capdevila and Mora's text has become a little fustian, and it's the duty of a stage director to resourcefully clear the dust that's settled and render it supple, to rejuvenate it without losing its essence in the process. Carles Ortiz either did not have those resources, or did not want to put them into practice; and the result was a safe but dull, antiquated staging, lacking spark. It's true that we are used to seeing many zarzuela productions where the balance between musical and theatrical is clearly tilted to the disadvantage of the latter; but that's in general true of amateur productions, and in those by certain private companies. It is pretty unforgivable when theatres with more or less consolidated seasons carry out such productions regularly, and where they do not prioritize the economics of the staging at the time artistic decisions are made. And when a production with a substantial budget and means to achieve the spectacle necessary for sarsuela makes do with such a flimsy production, it has to be asked what the future must be, assuming they really want to aim at a decent result. It's disheartening to see how the dominant current tone in Catalonia is total ignorance of their own music-theatre past. Except for the active associations of aficionados, who offer a relatively rich calendar of performances, and some isolated private initiatives (c.f. the Teatro Lírico de Barcelona under Josep María Damunt), not a single institution other than Amics of l'Òpera concerns itself with staging or concerts, let alone the study, editing or recording of their rich and absorbing repertoire. In this sense, that a house so clearly in the international musical forefront as the Gran Teatre del Liceu has not managed since its reconstruction and 1999 reopening (when the programming came into the hands of a representative public rather than private committee) to include, even marginally, any Catalan zarzuela - to ask for a non-Catalan zarzuela would be fantasy - is a clear demonstration of the political policy of the cultural management we've ended up with, but even more certainly is a palpable example of the genuine ignorance of a past which in many other aspects is celebrated with sickly obsession. Catalan sarsuela, just as surely those in the native language as those to Castilian librettos, yields rich cultural fruit; non-Catalan zarzuela was a cultural import solidly established in Catalonia during the second half of the 19th century and the first two thirds of the 20th, alongside Italian and German opera, but some excellent Catalan works were also written. Only the clumsy connection made between zarzuela and "Spanishry" (or rather "anti-catalanism") can account for the institutional forgetfulness of a historical repertoire that - as in the case of opera - can only become familiar to younger generations if it is actively promoted. From the rejection of non-Catalan zarzuela to that of sarsuela is one small step; and to apostatize the native product by considering it the result of foreign colonization, is crass error. To think that this year in which the centenary of Santiago Rusiñol is celebrated, nobody is going to take advantage of the occasion to revive a legendary work such as L'alegria que passa (with music by Enric Morera); or that nobody keeps an eye on the calendar to celebrate more or less random anniversaries of legendary premieres such as Lo cant de la Marsellesa (by Nicolau Manent), that will turn 130 next summer; is a concrete example of a genuine will to forget, as incomprehensible as it is annoying. At least we've had the hopeful news that the Sociedad General de Autores y Editores (SGAE) is renovating the old Teatro Español in Barcelona's Paral·lel - a famous old mainstream dramatic artery of the Catalan capital - to promote indigenous as well as contemporary artistic creativity. We hope that here sarsuela Catalan (and non-Catalan zarzuela) can be seen in conditions that can do justice to the musical and literary quality of works that despite this insistent forgetfulness, make up Catalunya's nationalist "patrimony".